Preventing the introduction of invasive species is the first line of defense against new invasions. However, even the best prevention efforts will not stop all invasive species introductions. Next to prevention, the most time and cost-effective way to manage the potential negative impacts of new invasive plants is through Early Detection and Rapid Response (EDRR) efforts. On this page you can learn about the weeds that we are actively looking for and that we would like your help in locating. You can learn how to report them if found and also about becoming a Weed Watcher and joining our EDRR network. 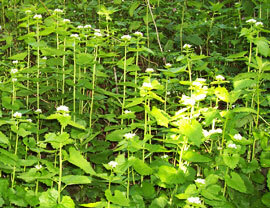 EDRR efforts include detecting noxious weed infestations when they first arrive in a given area, while their populations are still localized and small, and then rapidly beginning the control of these species. These efforts greatly increase the likelihood that new invasions will be addressed successfully and new weeds will be prevented from becoming established and widespread in a given area. The costs associated with catching weeds before they gain a foothold are also drastically less than those of long-term invasive species management for noxious weeds that have already become widespread. The East Multnomah Soil and Water Conservation District (EMSWCD) has developed an Early Detection and Rapid Response (EDRR) Program to detect and eradicate new invasive plants in eastern Multnomah County before they get out of control, and we are asking for your help. We have a list of eleven weed species that we wish to keep out of Multnomah County, or contain to the locations where they have already established. This list of species is known as our “EDRR list”. We are soliciting reports of the species from this list whenever they are found, and after gaining permission from whomever owns the land, we are committed to rapid deployment of a control team to the reported location. We greatly need your help to detect these new invaders. Read below to learn how you can help us prevent the next noxious weed introduction and follow the links to learn more about each of the weeds on our EDRR list. With your help we can prevent the next devastating weed from invading the places we live and love. The battle to stop the invasion cannot win with only the eyes of our staff. We need your help! The more eyes on the ground we have, the better chance we have of keeping new invaders out of Multnomah County. We provide trainings to individuals, groups, and organizations so they can learn how to identify, detect and report the weeds we wish to prevent from taking over Multnomah County. We are currently organizing volunteers who want to take a role in this natural resource issue. Contact Chris at (503) 935-5372 or chris@emswcd.org to get involved. Our crew is in the field most days actively searching for new occurrences of invasive species, but there is a lot of land that we just don’t have time to visit. It is the most crucial part of any EDRR program to have the public involved in the detection of new invasive species infestations. This means you learn the weeds on the EDRR list and look for them as you conduct your daily activities and recreation such as hiking, biking or on a walk around your neighborhood. We are actively recruiting interested parties to further strengthen our EDRR program. Go to oregoninvasiveshotline.org to send a report in all areas of Multnomah County. To contact the City of Portland EDRR team by phone, call Mitch Bixby at (503) 823-2989. To contact the WMSWCD team call Mary Logalbo at (503) 238-4775.